Are you upset that The Undertaker may now be wrestling Triple H instead of the long rumored Sting? For many years the wrestling world has been a clamoring for a dream match between The Undertaker and Sting. It was a perfect match between icons and faces of an industry that is built around respect. However, looking at this option with an unbiased view will lead you to believe that it may not be the best pairng going forward. We all know about the heartbreaking end of the streak at the hands of Brock Lesnar and pretty much are in agreement that we wish it would have been able to prosper. The truth of the matter is that the Deadman did not look like the Phenom, but instead moved around like a retiree. Undertaker followed his WrestleMania match with a trip to the hospital diagnosed with a severe concussion and was kept overnight for further evaluation.” Would he be able to carry a match with another over-aged wrestler? This brings us to the current storyline between Sting and Triple H. Triple H, while no youngster himself, is in a much better position produce a match to remember and leave an imprint as big as the one left by Undertaker/Brock match last year. Either way you look at it, Hunter is the younger, healthier and ultimately better option. Dreams of a match between Sting and the Undertaker have faded over the last few years. Age, injury and time have pushed both men a good distance from their primes. While WWE isn’t sure what Undertaker has left in him, it knows Triple H can still perform at an all-star level. His match against Daniel Bryan at WM 30 showed he still has the Cerebral Assassin minds-set and ability to produce inside the ring. After Sting’s debut at Survivor Series saw him drop Triple H to the mat, WWE has kept this narrative alive. The leads were very well portrayed in Triple H’s interview when he suggested that the reason the former WCW and TNA star never made his way to WWE has to do with him. Sting, who will be 56 at WrestleMania time, needs someone to carry him in the ring to a large degree. His illustrious star power and presence speak for themselves, but his opponent will have to do the majority of the work physically. The thought process is that even though Sting needs someone to take charge, he still has the ability to perform at a high level inside the ring. So far, the WWE version of Sting has been a man who resists tyranny and stands in the way of The Authority. He has only appeared twice, both times to push back against The Authority, in order to show he will not stand for the unjust abuse of power that has been portrayed over the last few years. The angle is similar to his WCW days, which includes his signature baseball bat and silent use of power. Will the story play out with Sting ousting The Authority for good, or will it leave The Game as the man to end his career. 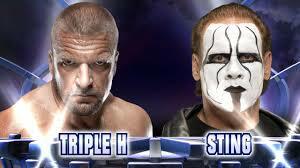 Either way you look at it, this will probably be the only match for Sting inside of the confines of a WWE ring. The storyline has been good so far and will continue to get better. I firmly believe that Triple H being the man to lock horns with the Icon is not only best for business, but the best game played in town. Next Next post: What is WrestleMania Without The Undertaker?